The shots team select their favourite 10 ads of January through June 2017. After the one-two punch last year of We're the Superhumans and Meet Graham in 2016, and any great advertising overshadowed by badly-received campaigns from Pepsi, Dove and McDonald's, 2017 has felt for some a slightly underwhelming year for advertising. 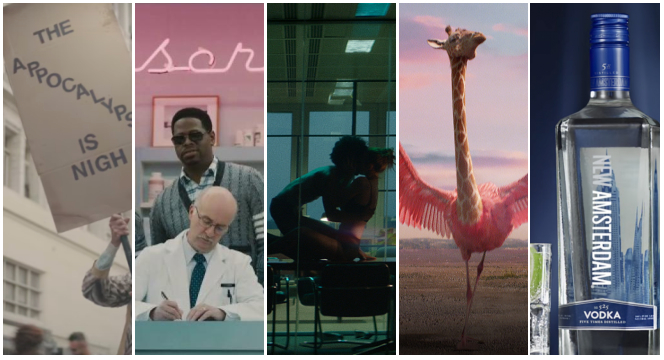 With that in mind, the shots team have got together and picked out our favourite adverts of the year so far, any of which could match the brightest and best of any year. Read below for our top 10 picks, as chosen by Tom Archer (senior researcher), Olivia Atkins (news reporter, Americas), Danny Edwards (editor) and Samuel Spencer (news reporter, Europe). 10. Lynx/Axe: Is It OK For Guys? We said: "The world may be uncertain about what it means to be a man. But the brand is clear and firmly believes that the best man a man can be is the man that allows himself to be happy and healthy." We said: "The cute animation helmed by Peter Sluszka is reminiscent of the Cannes-winning campaign, Dumb Ways to Die, thanks to its catchy jingle and meaningful message for the Food & Drug Administration Center for Tobacco Products." We said: "In Madness, the fast food brand take a harpoon at what they call hipsters and their coffee habits, contrasting their overpriced, obscure coffees in bizarre receptacles and oddly inspirational Wi-Fi passwords with the simple, affordable coffees available at your local Maccy Ds. " We said: "Things You Can't Unthink really lives up to its title. An old man in tight black pants is on all fours in front of a man in a tux. Unhinging his back, the man begins to play keys that cause throat singing-like sounds to be made. The guy we can only describe as the person-pianist sheds a tear, and the viewer's eyeballs shed pure disbelief." We said: "Produced by Hungry Man and directed by Wayne McClammy the spot is a big departure from the usual scantily clad women eating burgers the brand became synonymous with, and instead sees the brand focus on their food." We said: "The ad is an amazing piece of puppetry." We said: "This spot is bound to delight and disgust the internet in equal measures." We said: "Canon had looked scary to some people. Ask a casual camera user and they're like 'OMG, if i pick up a Canon I'll break it. I wouldn't know what to press, it's terrifying!' Whereas this new campaign says 'why not take a picture, experiment, play with it?'" We said: "An epic new campaign from Virgin Fibre through BBH London celebrates the entertainment which Virgin's fibre optic cables are able to deliver to customers." We said: "It's common knowledge that ostriches can't fly but in this beautiful spot from Leo Burnett Chicago, the team prove that anything is possible in an incredibly moving spot for Samsung's Galaxy S8." Click here for this month's most-viewed videos.